Welcome to Facebook Fridays for July 18, 2014! Does it feel like your luck has flat run out? Are unexplainable bad things happening in your life? Have you got a suspicion that an enemy is working against you? You may have been CROSSED! The solution? Our Lucky Mojo line of Uncrossing Products is just what the the Root Doctor ordered! 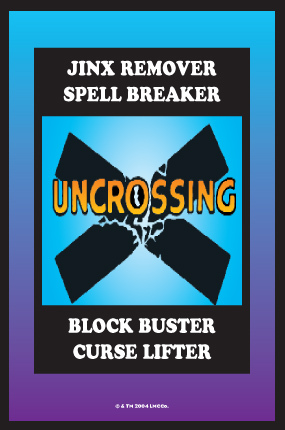 This week FOUR lucky winners will receive the benefits of Uncrossing. Our grand prize winner will get a complete Lucky Mojo Uncrossing Spell Kit. The runner up will get a blessed and dressed Uncrossing Vigil Candle. And two consolation prize winners will each receive a bottle of Uncrossing Dressing Oil. then scroll down, and post a comment to the Facebook Fridays! status message for July 18, 2014. First thing tomorrow morning, we will select Four winners at random, announce their names here, and ask them to go back to the Lucky Mojo Page at the URL above and message their mailing address, so we can send them their FREE Uncrossing products. We have a winner! In fact, we have FOUR lucky winners! Our Facebook Fridays! winners for July 18, 2014 are: D'Shawn Faison Russell, Jordynn M. Knott, Regina Fiore Linneman, and Seamus McKeon.